Πάμε τώρα για μια ακόμα φιλοξενία αλληλεγγύης! ΑΠΟ ΤΑ 7 ΜΙΚΡΑ ΕΧΟΥΝ ΜΕΙΝΕΙ ΜΟΝΟ 4.ΤΟ ΕΝΑ ΒΡΕΘΗΚΕ ΠΝΙΓΜΕΝΟ, ΤΟ ΑΛΛΟ ΧΤΥΠΗΜΕΝΟ ΑΠΟ ΑΥΤΟΚΙΝΗΤΟ ΚΑΙ ΤΟ ΑΛΛΟ ΔΕΝ ΤΑ ΚΑΤΑΦΕΡΕ ΝΑ ΦΤΑΣΕΙ ΚΟΝΤΑ ΜΑΣ.ΚΙΝΔΥΝΕΥΟΥΝ ΑΠΟ ΚΑΠΟΙΟΥΣ ΚΑΤΟΙΚΟΥΣ ΠΟΥ ΑΠΕΙΛΟΥΝ ΓΙΑ ΦΟΛΕΣ. ΕΠΙΚΟΙΝΩΝΗΣΑΜΕ ΜΕ ΤΙΣ ΑΡΜΟΔΙΕΣ ΥΠΗΡΕΣΙΕΣ ΑΛΛΑ ΔΕΝ ΕΔΕΙΞΑΝ ΚΑΜΙΑ ΔΙΑΘΕΣΗ ΝΑ ΑΣΧΟΛΗΘΟΥΝ ΚΑΝ.Η ΜΗΤΕΡΑ ΠΡΕΠΕΙ ΕΣΤΩ ΝΑ ΣΤΕΙΡΩΘΕΙ ΚΑΙ ΤΑ ΜΙΚΡΑ ΝΑ ΑΠΟΜΑΚΡΥΝΘΟΥΝ ΑΜΕΣΑ. ΑΝ ΚΑΠΟΙΟΣ ΜΠΟΡΕΙ ΝΑ ΒΟΗΘΗΣΕΙ Ή ΕΧΕΙ ΜΙΑ ΠΡΟΣΩΡΙΝΗ ΛΥΣΗ ΠΑΡΑΚΑΛΩ ΝΑ ΕΠΙΚΟΙΝΩΝΗΣΕΙ ΜΑΖΙ ΜΟΥ. 5 puppies and mother are at the beach area of Nea Epidavros ,Argolida. we think there were originally 7 or 8,one was hit by a car and the other was found drowned in the sea with a tin on it's head. 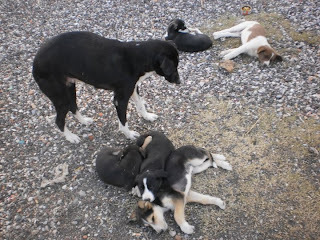 They are in immediate danger of the cold weather and people from the village who are threatening to poison them. 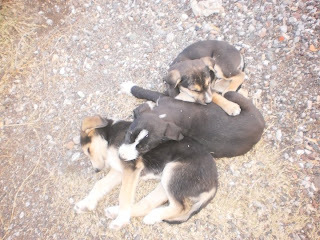 We need to find homes for the puppies and spay the mother. so far we haven't had any luck or help. the weather is getting worse and the lady that feeds them is leaving for Athens. We don't even know at this point whether anyone is even feeding them. They desperately need help..
Top Αλληλέγγυος: Ioanna Afentaki - Ανέλαβε την κάλυψη των 150€ για τη φιλοξενία των2 κουταβιών!!! Αναρτήθηκε από JENNIE στις 4:35 μ.μ.